The Student Composer Project has been a great success since its inception in 1990, encouraging young people to compose choral music. Three student composers will have the opportunity to have their works performed and recorded by the Choral Arts Chamber Singers in an in-depth masterclass led by Music Director Anthony Blake Clark and Composer and Peabody Faculty Member Joel Puckett. The composers will also attend Baltimore Choral Arts May 12 concert, Captivity to Liberty. NEW THIS YEAR: The three winners will each receive a $250 prize, and after the reading session the Chorus will present the “Singer’s Choice” Award of an additional $250 prize to one of the students. Composers must commit to traveling to Baltimore at their expense for the Master Class, and must live within 150 mile radius of Baltimore County. Composers must have been enrolled in high school or college as of December 31, 2017. Composers whose works have not been chosen previously will be given preference. The piece must be no longer than five minutes. The work may be scored for Chorus and Piano or Unaccompanied Chorus (mixed chorus, women’s chorus, or men’s chorus). Works for larger instrumental forces are accepted provided that there is an adequate piano reduction score to be used in the clinic. All compositions must be newly composed works. Arrangements of pre-existing compositions (i.e. carols, etc.) will not be considered. The text may be sacred or secular, in any language. The composer must secure copyright and permission to use published texts. Hand-written manuscripts will not be accepted. The deadline for submissions is Wednesday, March 27, 2019 at 12 pm. Submit Manuscript via email to karena@BaltimoreChoralArts.org. For questions and further information call Karena Ingram at 410-523-7070 x 306 or email karena@BaltimoreChoralArts.org. Presented on a Saturday morning, Christmas for Kids gives children the chance to share the excitement of a live concert with parents, grandparents, and siblings. Christmas for Kids is about an hour long, and it features playful characters, a story with music and movement, and familiar sing-along carols. Santa Clause makes an appearance too. It’s the perfect way to introduce your children to the joys of classical music. The 2017-2018 season’s Christmas for Kids concert will be performed on Saturday, December 16, 2017 at 11am in Goucher College’s Kraushaar Auditorium. The Baltimore Choral Arts Society piloted CoroLAB, an education program partnership, with Overlea High School in November 2017 to amplify Baltimore County students’ awareness about art and life through participation in a professional singing environment beyond their high-school offerings. To participate in a big project outside their normal scope of reference can transform a young person, building their self-confidence and skills, and this interactive learning will instruct them in self-discipline, teamwork, vocal technique, and more. At Overlea High School, 58% of students receive free and reduced meals, and 15% receive special education. Choral Arts will provide all necessary transportation and other resources. Choral Arts’ Music Director Anthony Blake Clark, in partnership with Overlea High School’s Choir Director Kellie Zephir, will lead this expanded program in the 2018-19 school year. 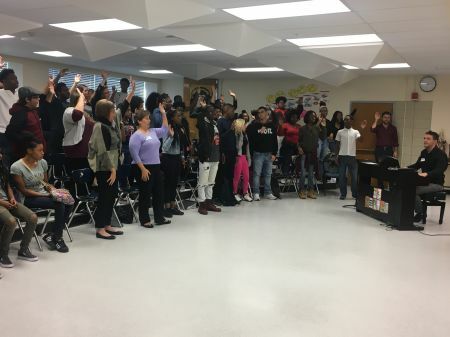 Last year, Choral Arts singers visited the school for Sing Out Day, in which the adult singers and student singers experienced collaborative singing. This year, this side-by-side program will include multiple visits to the school, as well as performance opportunities with Choral Arts. This program will impact 30-50 students in grades 9-12 at Overlea High School and will result in increased musical competency and technical skills for the students. We hope to bring CoroLAB to additional schools as the program grows. In the fall of 2018, Choral Arts will conduct a Sing Out Day workshop of vocal pedagogy for the students during Ms. Zephir’s 75-minute choir class, led by Mr. Clark and Leo Wanenchak, our Associate Conductor. The group will include members of our Chamber Singers, as well as Vocal Fellows, a new group of early-career professional singers hired by Choral Arts to elevate the artistic quality of the chorus. 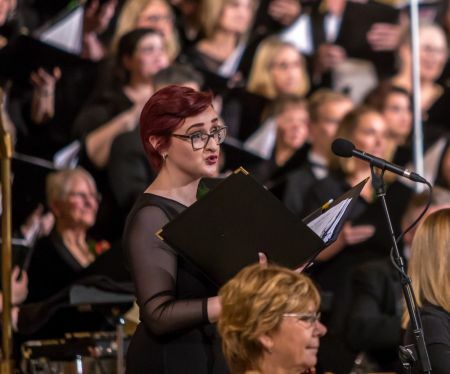 On December 16, 2018, Choral Arts will produce its annual Sing-Along Messiah at Goucher College, and students from Overlea will be invited to attend and participate, with transportation provided. Ms. Zephir will coach the students in a few of the movements from Handel’s oratorio so they are comfortable singing this repertoire. In early spring 2019, Mr. Clark will return to the classroom to workshop the students’ competition repertoire, which will likely include three rehearsed pieces and some sight-reading. He will be accompanied by one of Choral Arts’ professional singers who perform as a soloist and vocal coach. Receiving feedback from a professional singer will be invaluable for the students as they perfect their repertoire and technique. Mr. Clark will visit the classroom a few additional times in the spring to rehearse parts for The Monster in the Maze, a contemporary piece for chorus and orchestra by U.K. composer Jonathan Dove. 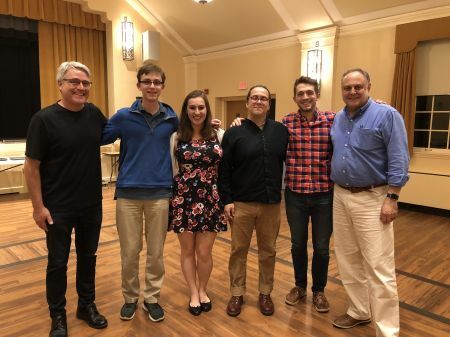 Choral Arts will perform the U.S. premiere of this piece on May 12, 2019 at Goucher College, and select students from Overlea High School will be invited to perform alongside Choral Arts’ adult singers. This “community opera” was written to be performed by both youth and adults side-by-side, and this collaborative, multi-generational performance will also include The Maryland State Boychoir, The Larks of the Junior League of Baltimore, The George Washington University Singers, the Choral Arts Orchestra, and Peabody Youth Orchestra. The Monster in the Maze describes the ancient legend of the Minotaur, his destruction by Theseus, and the triumphant liberation of Athenian youth, who will in part be played by Overlea students. Employment as contracted members of the chorus. 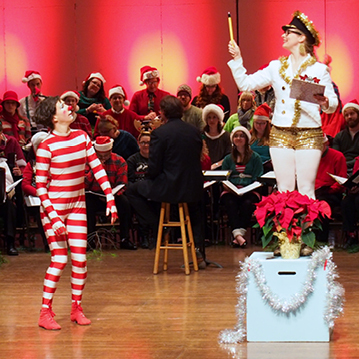 Opportunities to perform as soloists with Choral Arts throughout the season. Coaching experience as section leaders to help guide Choral Arts’ volunteer singers. Hands-on experience designing music curriculum and teaching youth through CoroLAB. Entrepreneurial training from Anthony Blake Clark and Leo Wanenchak on how to be an effective “team member” as a choral singer. Master class sessions led by visiting “mentor” artists covering topics including vocal techniques, vocal health, and audition techniques, including mock auditions. Access to the rich choral environment of the Baltimore/Washington, D.C. region through audition exposure.